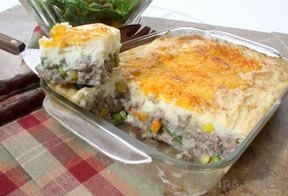 Shepherd's Pie is a classic, one-dish meal that combines beef and vegetables in a delicious gravy that is topped with mashed potatoes. 1. Preheat oven to 350°F. 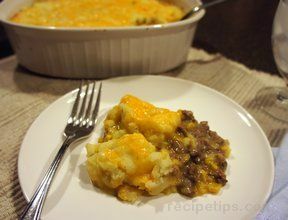 Brown ground beef in large nonstick skillet on medium heat. Drain fat. 2. Mix gravy mix and water in small bowl. Pour over beef. Bring to boil. Add peas and carrots. Reduce heat to low; simmer 5 minutes. Transfer meat mixture to 1 1/2-quart baking dish. 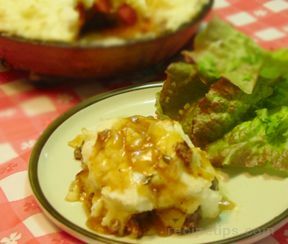 Top with mashed potatoes. 3. Bake 30 minutes until gravy bubbles and potatoes are slightly browned. Sprinkle with parsley, if desired.